A great meal idea for meatless Monday’s. Recently on the local news, the city of Vancouver, BC announced that they will be officially commencing with Meatless Mondays, encouraging residents to forego meat for one day a week for the sake of the planet and their health. As with everything that’s considered “change” there’s been a bit of controversy around it. Michael and I have been trying to cut back on the meat we eat on a weekly basis for a few years now and at this point we eat meat about 3-4 times a week now. It’s nothing I work too hard at or even think about any more. Fortunately there are so many great alternatives to meat available to us. 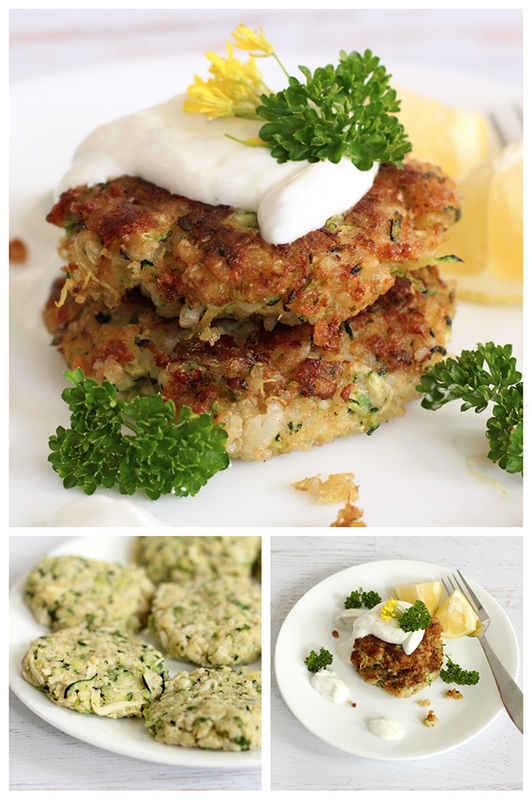 Last night I made some wonderful zucchini quinoa patties and thought it was worthy of a post. Our entire family enjoys them, even picky Noelle. It’s nice because you get some veggies and protein in one nice little package. I try to keep the frying down to a minimum, I lightly brown the patties and then I cook them through the rest of the way in the oven. This recipe has been slightly modified from this original recipe. Sprinkle ¼ tsp of salt on the shredded zucchini, put in a colander and let sit to draw out any liquid. Heat oil in a medium skillet and add garlic and green onions, ¼ tsp salt and pepper and cook until veggies are slightly soft. Remove from heat, drain off excess oil and allow to cool. In a large bowl, combine breadcrumbs, panko, parmesan cheese and lemon zest. The mix in lemon juice, quinoa, rice, and cooked green onions and garlic. Add in egg and shredded zucchini. Mix everything together thoroughly and start forming balls (a little smaller than a golf ball) and then carefully flatten into a thick patty. Heat oil (just enough to evenly cover the surface entirely) on medium-high heat in a large skillet. Carefully place patties into the pan and cook for a few minutes on each side until it starts to lightly brown and get a little crispy. Remove from pan and place to a paper towel covered plate. Dab off any excess oil with more paper towel. Move patties onto a baking sheet and cook in the oven for 15 minutes, turning over at about the halfway point. Remove from oven, allow to cool slightly and serve with the chilled yogurt sauce on top.